(Dan Trimmer, 2000). (Victorian Collar x Mohican Sun) Tetraploid 38” 6 ¾” Evergreen. M. Re. When all is said and done, color is the single most important element in most gardens. 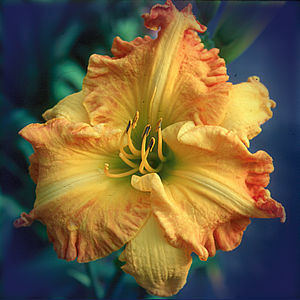 MOHICAN SUMMER displays its glowing gold, slightly brushed with orange, blooms on tall erect scapes. Typical budcount is 20 carried on two laterals and a terminal Y. When we first moved to Florida it was Ra Hansen who first noticed MOHICAN SUMMER and whenever I saw her she would ask about it. Ra has is no longer with us, but whenever I see MOHICAN SUMMER I think of her. 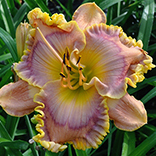 MOHICAN SUMMER is pollen fertile and maintains its large bloom size throughout the season.